I am so thrilled to announce that this Sunday March 03, 2013 I am co-hosting a very special event. 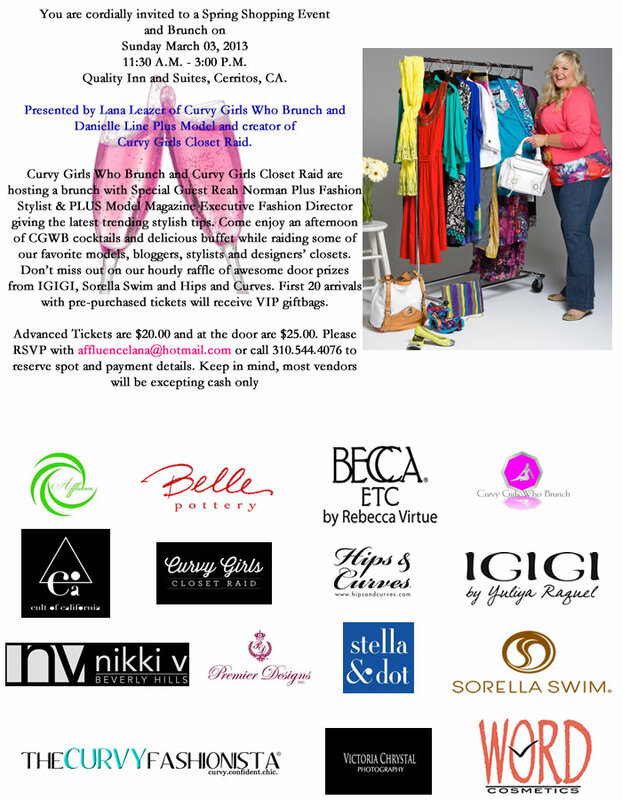 In collaboration with Lana Leazer of Affluence PR and creator of “Curvy Girls Who Brunch” I have brought my Facebook group “Curvy Girls Closet Raid” for an amazing day of indulgence. Shoppers will sip on delicious cocktails and scrumptious brunch, all while networking and shopping with some of LA’s top plus size models, stylists, bloggers, and designers in the industry such as “The Curvy Fashionista” Marie Denee, Plus Fashion Stylist & Plus Model Magazine Executive Fashion Director Reah Norman, Veronica Cid of “Cids Style File“, Model & Actress Joy Nash, Plus Model & Stylist Melinda Mann, Hips & Curves, Sorella Swim, IGIGI, Cult of California, and yours truly. We will also have makeup and skincare vendors offering mini makeovers and samples, a variety of amazing jewelry vendors. Dress your best ladies because we will have Plus Model Magazine and Curvy Magazine there as well as professional photographer Victoria Chrystal Photography. © Danielle Line 2015. All Rights Reserved.